The main public transportation in Shanghai includes buses and subways. Refer to Figure 1 for the subway system in Shanghai. Please visit http://www.exploreshanghai.com/ metro for a larger, adjustable map. There are 13 subway lines; the colored legend is provided in the figure. *Please note that the taxi fares are estimated. The actual costs are based on traffic conditions. 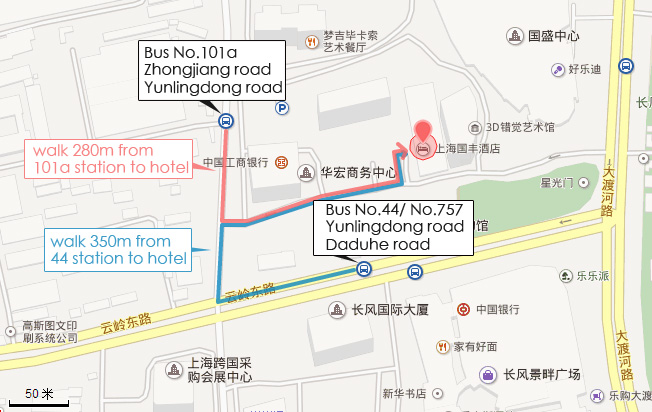 Take Line 10 to Shuicheng Rd.Station (Exit 2), transfer to Bus No.757 and take off at Yunlingdong road & Daduhe Road, then walk about 390m to the hotel. Take Line 2 to Weining Rd.Station (Exit 2), transfer to Bus No.101a and take off at Zhongjiang road & Yunlingdong Road, then walk about 280m to the hotel. 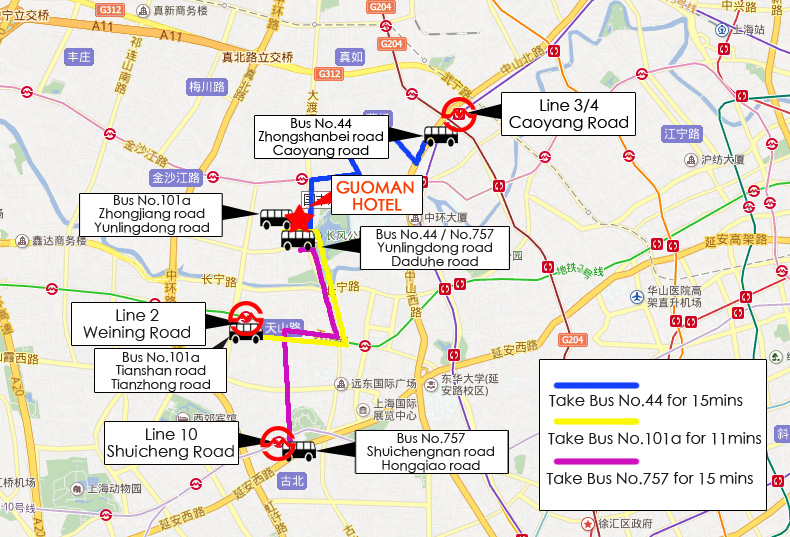 An alternative from Pudong International Airport to GUOMAN HOTEL is to take Airport Shuttle No. 6 and then get a taxi to the hotel. It will cost less than taking the taxi directly from the airport. You can get a taxi when you get off the airport shuttle. Take Line 3 or Line 4 to Caoyang Rd.Station (Exit 4), transfer to Bus No.44 and take off at Yunlingdong road & Daduhe Road, then then walk about 350m to the hotel. Line 3 to Caoyang Rd.Station (Exit 4), transfer to Bus No.44 and take off at Yunlingdong road & Daduhe Road, then then walk about 350m to the hotel. You may show the following address to the driver when take a taxi : 大渡河路388号国盛中心 (Chinese spelling: dà dù hé lù 388 hào guó shèng zhōng xīn). He/she will take you directly to the hotel.